Yeah, I’m going to drive the car some this year (Hey! It’s MY money that bought it and will run it). But I’m 50+ years old, and my Honda IndyCar PR commitments will make it impossible for me to run more than three or four National races this year. So, we’re going to try to find someone young and fast to put in the car for those SCCA weekends when I’m doing my IndyCar thing, and we’ve already had some encouraging talks in that direction. In addition, Quantum has bought a second Van Diemen RF98 FF2000 that we plan to convert into another Honda FF. 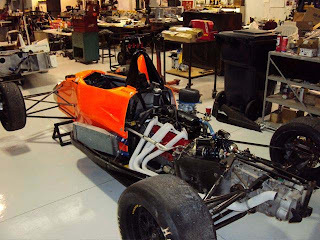 It has joined the “Winter R&R” project lineup at the shop along with my car, Quantum’s Van Diemen FF2000 Zetec (which is slated to run the SCCA East Coast Pro Series in 2010), and a pair of Lola Sports 2000s. For those of you keeping score, that’s three Van Diemens and two Lolas, all in various stages of “refresh & rebuild”. It’s going be a busy winter in Oklahoma City. But first things first. Within an hour of arriving at Quantum and unloading my Van Diemen, it was time to start taking it apart for inspection and replacement of any broken down and/or worn-out bits. The good news is there were no major, nasty, expen$ive surprises. One of the tri-pod joints was junk, a couple of bearings and bushings were worn out (in the gearbox, steering rack, etc) but all-in-all, it was just about what you’d expect from a car of this age and mileage. I’ve got to compliment Jim Geithner, the car’s previous owner, who was completely honest in his dealings with me; and accurate in his descriptions of the car, its history and condition. It was a pleasure doing business with him. Wendell DID find evidence of a pretty big hit to the rear of the car at some point, most likely from the period when it was a Pro FF2000 car. That will require some repair work – and perhaps some time on the shop surface plate. But again, that’s no great shock for a car with around 35 total races in two separate pro series on its resume. The guys also pulled the engine out right away, and it sold almost immediately for $5,500, much faster than I had anticipated. I didn’t even need to advertise it, word-of-mouth in the FF community got it done. I love it when a plan comes together. That’s about a wrap for now. The next edition of this blog will follow in January with a recap of the chassis R&R process and our finalized race schedule for 2010. I’ll be heading back down to the shop again shortly to "help out" and make a seat for my old, fat, self. The Fit engine and chassis kit parts should arrive in time for February’s report and – assuming the Honda FF is approved for SCCA competition starting in March – we’re aiming to debut at the March 5-7 Double National race weekend at Texas World Speedway in College Station. With five cars (two FFs, an FF2000 and two S2000s) in various stages of winter rebuilds, the Quantum shop is a busy place in December. The "Kent" engine seen here in my car? Already pulled out, inspected and sold!! !